We are repeat guests at Kapaa, and this condo is exceptional. It has everything one needs to enjoy a vacation. We already reserved it for two stays in 2020. I wash dishes by hand, and will buy a dish rack and wash basin at our next visit. Great! Second time i rented from Hula Now first time the Islander and this time the Sands I will continue to use Hula Now ....always helpful and a pleasant experience. Yes the condo met our expectations!!! It was perfect ..it was exactly like the pictures showed. Beautiful, clean and nice! The view from the Lanai incredible!!!! I saw one review that said you could see the sunrise from the bed and you can!!!! I specifically rented a 2nd story room because i wanted to leave the sliding glass door open all night with the just a screen door closed....so I could hear the ocean...I did not have to do that in this condo there are windows beside the sliding glass door that you can open and hear the ocean wonderfully. I will be returning to Sands #9 again...loved it! Thank you for providing such a wonderful space on such a beautiful island! Yes it met our expectations, very nice. Seems rare anymore when online pictures and descriptions match or exceed on the ground reality. We would definitely stay there again. 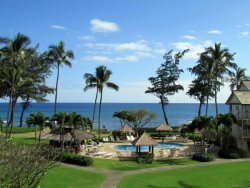 They have the Aloha Spirit and are helpful and attentive, the grounds are beautiful. It met my expectations. Absolutely wonderful just need a few spices and condiments like coffe sugar and creamer on hand. Gorgeous view! The landscape was amazing like walking through a new ecosystem. Easy walk down to private beach! Booking the room by phone was very simple & afordable. Yes love this unit. Stayed here last year, could hardly wait to come back! Excellent. Extremely responsive to our needs. Unit #9 was fantastic. We felt comfortable and safe in the condo and complex. The condo had everything we needed to make our vacation wonderful. There were beach chairs, beach towels, boogie boards, etc. We loved watching the locals fish in the morning and catch lobster at night. It was hot but if you had all the windows open, the trade winds cooled the condo off perfectly. Very attentive and helpful, returned calls quickly. The condo was very clean and nicely decorated. The kitchen had everything, the only suggestion would be maybe some spices or at least salt and pepper. Beautiful setting. Every time I walked out side the smell of the flowers in the air was amazing! Excellent. Yes, it met our expectations. Excellent service. Yes, it met our expectations - it was beautiful. Excellence working with the team. I almost hesitate to say how wonderful this unit is. I want to be able to book it again on our next trip, and I do not want it booked up! The unit was fresh, clean and had everything that we were looking for. I loved the view and the jungle feel of the landscaping. We never have much expectations for the beaches in Kapaa, other than good for sunrise viewing, etc. But this beach was actually nice and had usable areas. Saw a number of turtles right from our Lanai. The bed was very comfortable and we could view the sunrise from bed with our cup of tea! We went to bed with the sounds of the waves lulling us to sleep. We were always comfortable with the temperature. The windows allowed for a cooling breeze along with the ceiling fan. Had beach chairs, umbrella and boogie boards which were all new and in great shape. Beach towels provided and plenty of closet space for all of our belongings. The decor and colors were very relaxing. After years of staying other places in Kapaa, we have definitely found the place we want to return to! Condo and stay was just perfect. Our experience was amazing. Our booking agent at hulanow.com who we have nicknamed our personal "Travel Fairy" because of the care she put into answering our needs even before we spoke them. This particular condo was refreshing to find that the owner had fully updated and remodeled the unit to a level of today's modern fit and finishes. The kitchen was full stocked with the essentials for a dining in experience. The furniture as well as the bed were very comfortable. This particular condo came with those same high end perks you would find in other 4 & 5 Star hotels, such nice personalized guest robes. If you have viewed the website pictures the view speaks for itself. Gorgeous waterfront studio. Would have loved a king bed, bath tub, and luggage racks. Other than that the room was clean, freshly painted with soft sea blue and nice furnishings. Great working with members of the team. The condo - It was lovely. Yes indeed, met our expectations. Very quaint, great view and fully appointed with what you will need. Thank you! Great! Yes it was even more beautiful in person. Cleanliness is number one for us and we were very pleased. Also, it was great to have mats, beach chairs and coolers available. Small details but can greatly add value to our stay. We would definitely stay here again! Yes, we were very pleased with the condo. Beautifully decorated, well maintained and very clean. We really enjoyed it! Met and exceeded. It was exactly like the pictures, which is always a nice surprise. Had everything we could have wanted, from the kitchen to the extra amenities, like beach chairs, coolers, umbrella, boogie boards, etc. We were here for our 20th anniversary and, with the exception of the morning alarm (rooster), was incredibly relaxing and just what we were hoping for. Yes! The condo was perfect! Loved it and can hardly wait to stay here again. Lovely. Sharing. Very well appointed. Yes- the condo was very good and exactly as advertised. Your web and e-notification system worked very well and we received all the information at appropriate times. We never had any direct contact with your team members for the duration of our stay but the whole operation seems very efficient. Thanks! Excellent. What an amazing condo. You know that feeling when you are about to open the door to a vacation rental for the first time and wonder what it will be like? Will it meet your expectations or not? Will you willingly accept a few compromises for a vacation? Or will the condo surpass the pictures on the website and exceed all of your expectations? Well opening the door to this condo for our 25th Anniversary get-away exceeded all expectations. We were greeted to a comfortable, clean, bright studio and the roar of the ocean surf on the beach from the full-window view at the back of the unit. The condo is outfitted with a full kitchen with modern appliances, nice place settings, really cute coffee mugs, plenty of pots and pans, and even a couple of trays for carrying meals and snacks to the lanai (for watching the sun rise in the east, the sky change color for the sunsets, and ocean-watching for all times in-between). The kitchen had other nice touches like ice packs in the freezer that you can use with the supplied coolers when packing an away-lunch, a Cuisinart coffee maker (much nicer than a low-end coffee maker), and plastic containers that can be used for left-overs. Besides the great kitchen the units was nicely decorated and included modern, dimmable LED lighting and updated faucets, sink, etc in the bathroom. There was even a built-in light-sensitive nightlight integrated into the bathroom electrical outlet (it took us a night to figure out where the light was coming from). The unit also included a beach umbrella, a body board, plenty of hangars in the closet, etc. The bed was comfortable, the view of the ocean amazing, and the location of the condo perfect (plus there are two bakeries and a great coffee shop in short walking distance). Absolutely. What a treat to enter this lovely condo that would greet us after a busy day of exploring Kauai. The pictures were exactly what we found.